There was a period in the 2000s when primary commodity prices appeared to have bucked their long term trend of stagnation or decline. 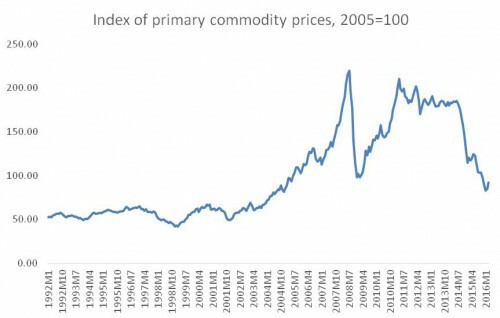 As Chart 1 shows, between the trough of December 2001 and the peak of August 2008, the price index for all primary commodities (in US dollar terms) rose by 445 per cent, that is nearly four and a half times. This increase came after a decade of relative stagnation in nominal dollar prices (which reflected a decrease in relative prices of commodities) over the previous decade. The strength and rapidity of the increase in prices over the 2000s led some analysts to argue that changing patterns of global production and consumption meant that there would be secular tendencies towards increase in such prices in the medium term. In particular, the more rapid growth of and therefore increased demand from China, India and other “emerging markets” was seen to indicate a structural shift in global demand that would generate continued increases in primary commodities prices for some time. However, this was at best a partial – and at worst a misleading – argument. As it happens, much of the increase in prices (and their velocity) was due to speculative activity in such markets, aided by the financialisation of commodities as the involvement of non-commercial players in the commodity futures markets was both enabled and grew more significant. This became starkly evident with the subsequent collapse of such prices in the second half of 2008. The revival of such prices from early 2009 once again did not reflect “real” economic forces so much as the impact of loose monetary policies in the North after the Global Financial Crisis. Almost unlimited access to funds combined with near zero interest rates and continued inadequate regulation to make investment in commodity futures relatively attractive for financial players. 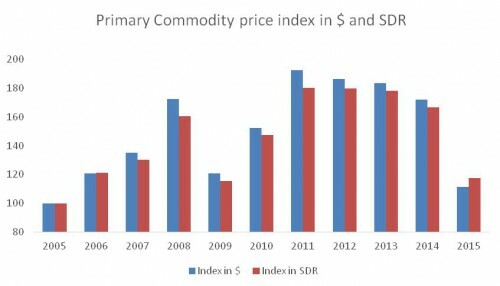 So in the following years, the IMF’s primary commodity price index rose almost to its previous peak and stayed high even without any significant revival in global real demand and with faster expansion in supply relative to demand. But that phase too has been over for around two years now, as the index has fallen sharply once again, and in the first quarter of 2016 the index was around 55 per cent lower (or less than half) of the level achieved in mid-2014. Since this index is calculated in terms of nominal US dollars, it would obviously be affected by exchange rates, and it is true that the US dollar did indeed fluctuate quite a bit over this period. Chart 2 describes the change in the index in both dollar and SDR terms, and it is immediately evident that the variations in SDR terms were generally not as sharp. In general, periods when the US dollar is stronger tend to be those of lower commodity prices, reflecting the dollar’s significance as the underlying numeraire for currencies across the world. However, even in SDR terms the recent decline in the price index has been steep. It now seems – and indeed this is confirmed by projections from almost all the major international organisations – that this particular “commodity “supercycle” is now in the phase of downswing and primary commodities will stay low for the next few years. Since finance no longer finds this an attractive outlet, this will further add to downward pressure on prices. What does all this mean for the developing countries whose economic fate still seems to be tied closely to the movement of primary commodity prices? To assess this it is necessary to disaggregate the price behaviour of different categories of commodities, since this will affect importers and exporters differently. Chart 3, which provides such a disaggregated look, shows that the most volatile prices have been those of food and fuel. In the most recent phase, the sharpest decline has been in fuel prices, and particularly in oil prices, which is clearly bad news for oil exporters and good news for oil importers like India. However, even for the latter, the news is not uniformly good, since the declines in exports and therefore incomes of oil exporters have meant declining import demand from them as well, which in turn has affected the export demand for many oil-importing developing countries. Similarly, food prices have come down sharply from their peak, which affects food exporting countries and also indirectly feeds into domestic food inflation in most countries. However, while global price increases show high pass-through to domestic prices, declines in global prices do not always translate into declines in domestic food prices. In many developing countries (including India) food prices remain high and even increasing in a wider context of deflation. So farmers may be losing out from the global price shift, but consumers are still paying relatively high prices for food. The other interesting point that emerges from Chart 3 is that some commodity groups, particularly agricultural raw materials, have shown very little change over this entire period. So commodities like cotton and jute did not really experience significant price hikes, which means that they have also not declined as much – in fact, their prices have fluctuated around a stable trend. So farmers producing non-food cash crops did not get to cash in on the boom but they still now face the effects of what is generally acknowledged to be a slump. 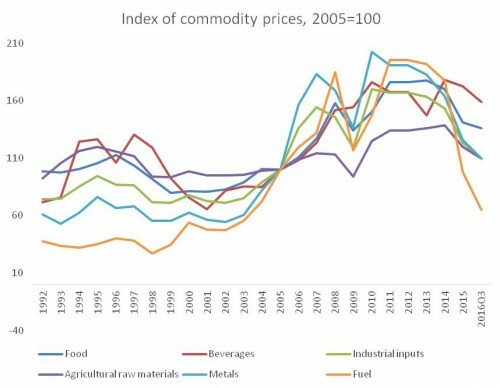 The price trends described above show how financialisation of commodities has served to amplify and exaggerate instabilities and fluctuations, in ways that do not benefit either direct producers or consumers. Originally published in the Business Line.